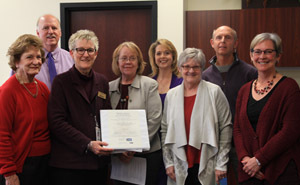 Record of Past President’s Kansas Connection Presented to Trustees at Butler Community College. The President Obama’s Kansas Heritage Project members presented Butler Community College Board of Trustees with a compilation of their work during the board’s regular monthly meeting. The notebook contains oral histories, finding aids, and transcripts of citizens in Butler County who knew former President Barack Obama’s mother’s parents. Their mission is to capture, preserve and celebrate Obama’s Kansas heritage and honor the role of Midwestern values within our nation. Butler Community College staff on this committee include Micaela Ayers, Teresa Baumgartner, Stephen Cless and Becky Lingafelter. Other committee members include historian Jay Price, PhD., from Wichita State University, and USD 490 representatives Doug and Julie Jensen. Members Marie Gillespie, Kym Dickey and Dr. Sarah Johnston will also be present. Ayers, the Director of Libraries and Archives, and Baumgartner, Co-chair of President Obama’s Kansas Heritage Project, spoke on the group’s behalf. The Project group met monthly at Butler’s L. W. Nixon Library to arrange a web site containing the collection of oral histories, transcripts and research involving Obama’s Kansas background. Both sides of the past president’s mother’s family migrated to Kansas in the nineteenth century. Obama’s maternal grandparents, Madelyn (Payne), from Augusta, and Stanley Dunham, from El Dorado, lived in Wichita and El Dorado. It was in these towns that Obama’s mother, Stanley Ann Dunham was born and spent her early childhood. Although President Obama never lived in Kansas, he acknowledges his Kansas heritage. During his presidential candidacy in 2008, Obama visited Butler Community College to speak about his Kansas roots and his family’s search for the American dream. All information gathered from the President Obama’s Kansas Heritage Project will be available on the website www.obamakansasheritage.org and in the library archives for the use of future students.